"Thank goodness for Mahonia" edition. I don't have a lot blooming right now but my Mahonia 'Arthur Menzies' is putting in overtime, making sure that every hummingbird in the neighborhood has a food source to fight over. I love this shrub and it's been blooming for over a month now. 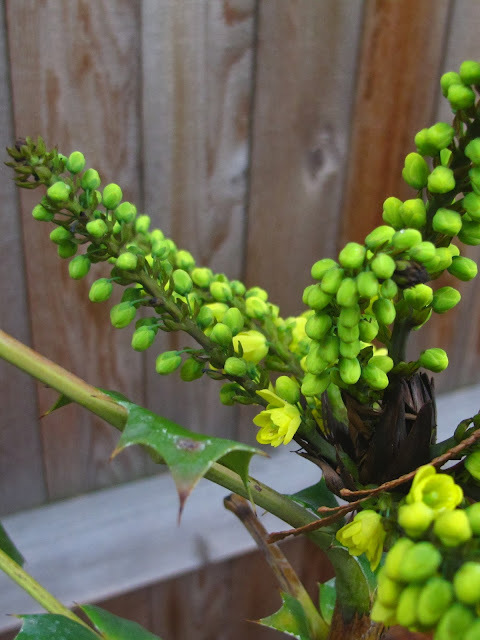 My Mahonia 'Charity' hasn't bloomed and doesn't look inclined to, but a recently acquired Mahonia 'Underway' is just starting to bloom. Just one hellebore has started blooming . . . the others are almost there. While I don't have a ton blooming right now, I couldn't be more delighted. Every day that goes by means more sunlight and every month will bring more and more blooms! How lucky are we? Happy bloom day and thank you Carol of May Dream Gardens for hosting! Ack! Here I go, complaining about 'Arthur Menzies' again. Once more, the trusses fattened then blackened in the cold. Oh well...I claim to not be about flowers and the shrub is very pretty without them. Love Mahonia and have one that was gorgeous for a year then declined. It might be the crippling heat and humidity, but they are wonderful plants and the bees love them so. It's been eons since I killed my last mahonia, so it might be time to try again. 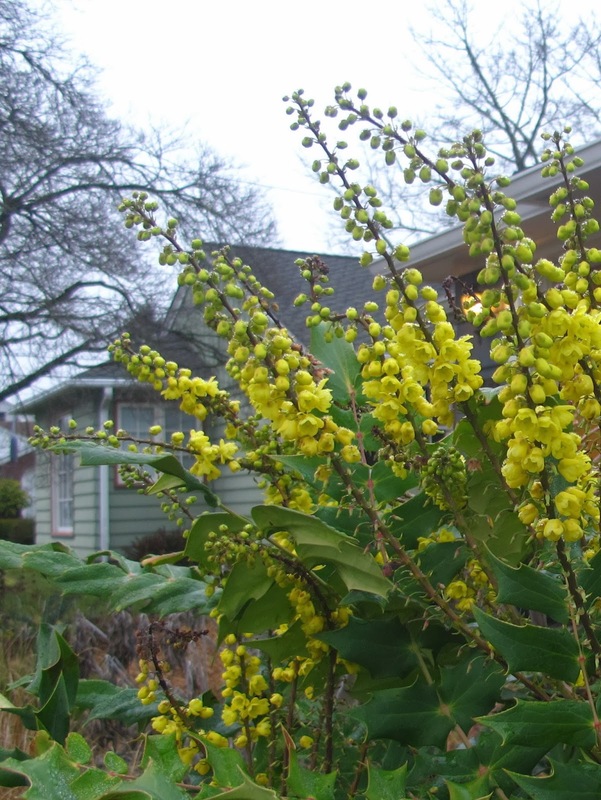 Amazing how many great yellow-flowered shrubs there are for January, what with the mahonias and acacias and whatnot. Those are some gorgeous flowers, and I'm sure the hummingbirds thank you! They seem to thank me by dive bombing me every time I get near the mahonia. :) I've gotten the message loud and clear that I am just renting it from them! Most of mine are still in the bud phase but that Cinnamon Snow starts blooming December. I really love them. Good thing, I have amassed five different kinds somehow! Have you watched Carol Klein's Life in an English Cottage? She shows how to crossbreed hellebores and I really want to try it. We've probably got a thousand different cultivars between all the garden bloggers. Oh, that's too bad! We're very lucky here, we have almost no humidity in the summer. That's crazy that yours blackens! We got down to six degrees here and I was so worried that mine would follow suit. Is it the snow that rots them? I'm so excited for spring! They thank their stars and dive bomb me! I would love to try it also! I need to watch this. The whole series in on YouTube and it's woooonderful. I'm envious of your blooms! My hellebores won't bloom (if all - it's my first year with them so we'll see) for another month or two. I planted a whole bunch of hellebore starts this fall and I don't think any of them are going to bloom. I'm hoping that next winter will be an extravaganza! Waiting is so hard. I don't have any blooming mahonia, and I'm feeling bereft. 'Arthur Menzies' is intense and wonderful! It would be such a good compromise plant for you and the mulchman! I like those Hellebores. I just planted my first Hellebores last fall and I'm hoping I see some blooms in March (or April). I'm loving your blog! It's making me so homesick for Portland. I think I might have a break down soon and start "putting a bird" on everything! You're blog is helping me to avoid that potentially embarrassing situation!